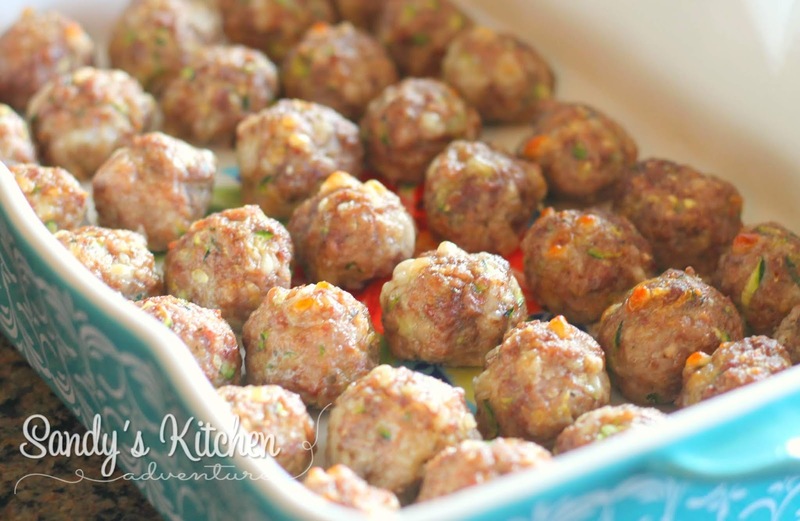 Looking for a quick and easy meatball recipe to prepare that everyone will enjoy! Try these low carb, gluten-free Italian zucchini meatballs! Both the kiddos and adults will approve! The Bonus? There are veggies in it! Don't tell the kiddos though! 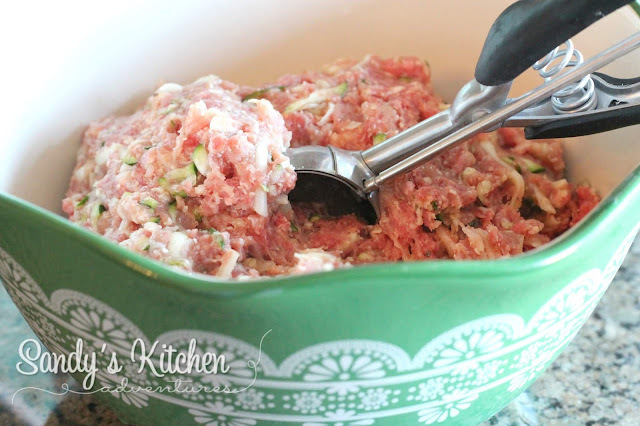 The zucchini helps keep the meatballs moist without the use of breadcrumbs. Meatballs are perfect for Monday night football so I will be serving these along with some other goodies tonight! Shred the zucchini and squeeze out all the excess moisture. I only needed one medium sized zucchini to make 1 cup of shredded zucchini for this recipe. A little tip! If you have a french press, use it to squeeze out the moisture from the zucchini. Simply put the shredded zucchini at the bottom of your French Press. Place the top over and press down, like you would with your morning cup of coffee. Then drain! That's it! 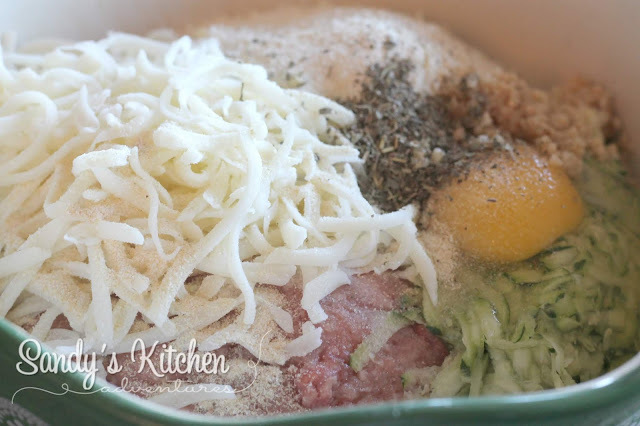 Combine all the ingredients for the meatballs in a large bowl. Definitely, use a large bowl because this recipe makes 6 servings! 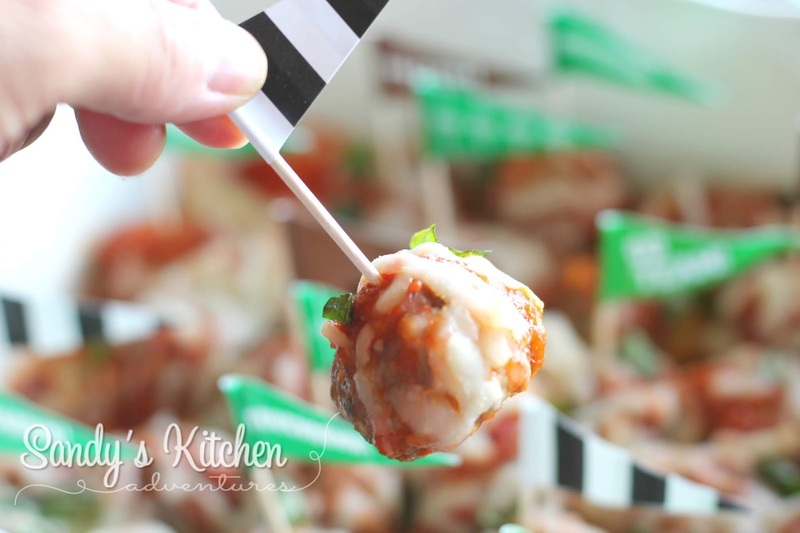 Use a small cookie scoop to scoop out the meatballs and place them on a cookie sheet. I made exactly 42 meatballs which was perfect since I had 6 servings which gave me a nice round number of 7 meatballs per serving. 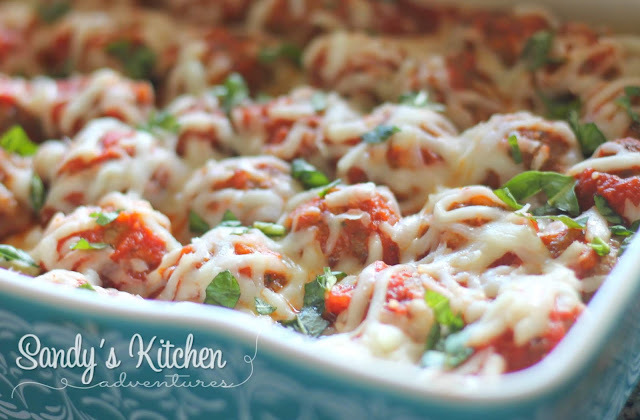 Bake the meatballs for about 20 to 25 min or until cooked through. I transferred the cooked meatballs to a 9 x 13 casserole dish to remove them from the grease and liquid from the meatballs. 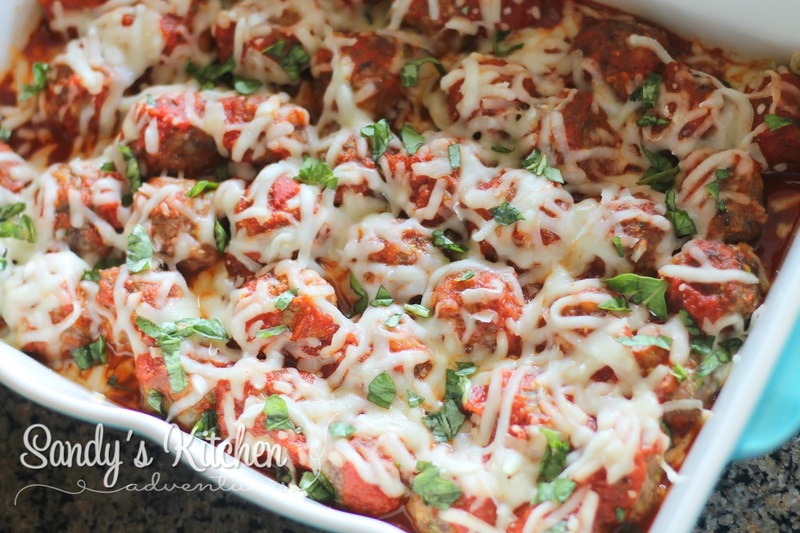 Top the meatballs with 1 cup of an approved marinara sauce and the remaining 2/3 cup of mozzarella cheese. Bake for an additional 5 to 10 min or until the cheese has melted. Garnish with fresh basil. 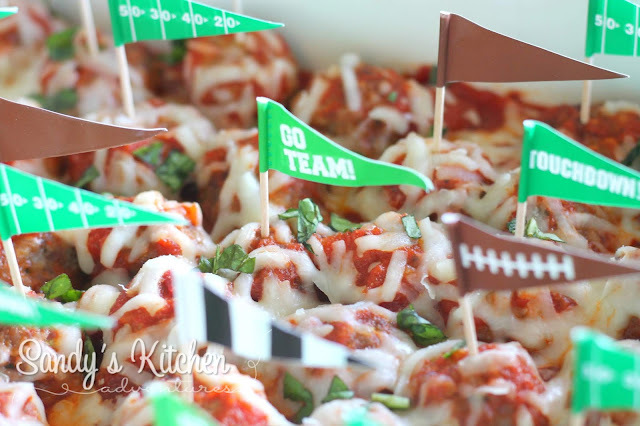 I placed little football flags in the meatballs to be Game Ready! Go Team! Serve this with 2 Greens of your choice! Enjoy! Lightly spray a baking sheet with cooking spray or use a non-stick silicone mat with the baking sheet. Shred zucchini and squeeze out excess moisture from zucchini using a clean dish cloth or cheesecloth. Combine all the ingredients for the meatballs in a large bowl. 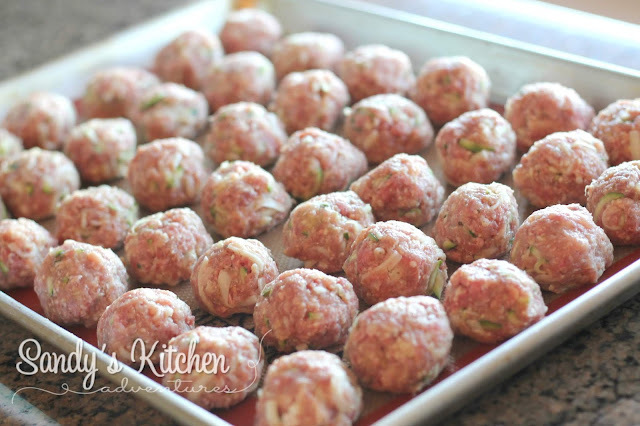 Use a small cookie scoop and scoop out small meatballs and place them on the prepared cookie sheet. Bake for about 20 to 25 min or until cooked thoroughly. Drain the grease. Top with marinara sauce and 2/3 cup cheese. Bake for an additional 5 to 10 min or until cheese has melted. * You can substitute 14 oz of Jennie-O bulk turkey sausage instead of 16 oz Jennie-O sweet Italian turkey sausage or 93% lean ground beef.